“How did you do it?” People often ask me this question. All I can say is that I never experienced the “denial stage,” when he was diagnosed with ten symptoms labeled of him at two years old. I quit my job and guided him. Clarence Manago Cruz, a 17 year old Person with Autism. My son is now 17 and a freshman at the Silliman University, Dumaguete City, taking up Bachelor of Science in Performing Arts, Major in Speech and Theater Arts. Academically, he doesn’t have any problem as he passed all his first semester subjects including ROTC (Reserve Officers' Training Corps). He has a special assignment, not because he is a PWA, but because he has asthma. He managed to enroll himself for the second semester. Clarence, (2nd Level to the right side) together with his classmates in Speech and Theater Arts. His obsessions are movies and can memorize dialogues of some of the films of his original movie collections. At 16, he applied for a non-pro driver’s license at LTO-Dumaguete City after attending a seminar and taking the exam. He now owns a motorcycle and drives himself to Robinson’s Mall on Saturdays to unwind. Sundays, he does his chores, cleans his room and brings his laundry to the shop for washing and ironing. He also cooks his own breakfast, like canned goods, noodles or hotdog, using his rice cooker/steamer and buys lunch and dinner at Budget Meal, a fast-food restaurant catering to students. He dreams to become a famous singer and famous actor as well. He used to sing in a band with his classmates in high school. Recently, he was invited to render two numbers for the participants of ASP’s 2nd Regional Autism Conference in SM, Cebu City. 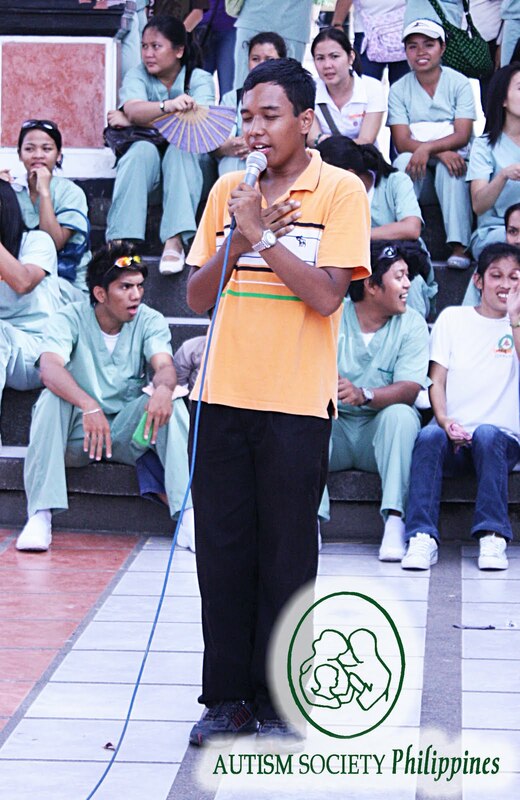 Every now and then, he is also invited to sing in the activities of GPRehab, an organization supporting persons with disabilities. He can be very ambitious and persistent about his dreams of becoming a famous singer, like Martin Nievera or Gary Valenciano; be a famous actor, like his idol, Actor John Lloyd Cruz and do a film with him. 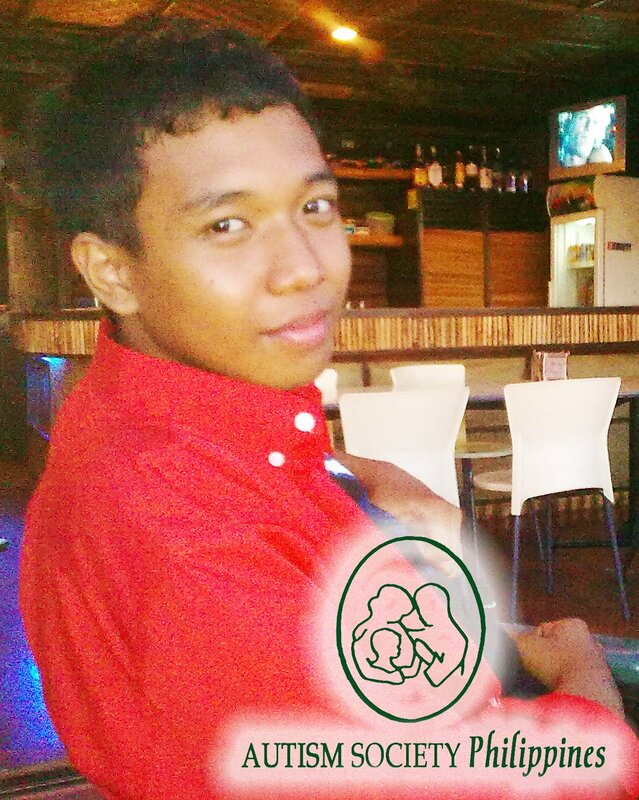 Clarence Manago Cruz, is living independently in Dumaguete City, and he has autism. He lives in a three-bedroom house together with two other people, but prefers to have his own room. “….In order for me to have privacy,” he would candidly say. My dream is also to educate schools and society about autism. I hope to help organize in the future, Pagadian and Ipil Chapters. I hope that mothers, teachers and other professionals will collaborate with each other to build the future of our children. ASP Dipolog Chapter recently conducted a successful ABA Seminar Workshop courtesy of Peace Corps Volunteer David Eisenhart. Click here to read more. Clarence is blessed to have a great mom who helps bring out his maximum potential. I wish and pray that my son will achieve or reach what Clarence did too. It's only now that I have proven that a child with autism will go a long way too. Commend you also for being a great mom. Pls. continue inspiring us. Congratulations to Clarence, and to his loving parents! Hello po. My name is Clarence Cruz, born on December 17, 1992 (age 18). I was born in Zamboanga City, but I'm currently living in Dipolog City. Meron po akong autism. Nangangarap po ako na maging isang singer/actor para makatulong po ako sa aking pamilya at iremind sa lahat ng mga taong may kapansanan, lalo na 'yung mga may autism, na kahit na may mga disabilities po kami, matutupad po namin ang aming mga pangarap at makakatulong po kami sa aming pamilya. I really need to have a showbiz career para makaahon po kami sa kahirapan, at maging proud sa akin ang pamilya at kaibigan ko, lalo na 'yung nanay ko. I also want to be an inspiration to all persons with disabilities, especially the autistic ones. I wish you would give me a chance to be one of ABS-CBN. If you wish to contact me, here's my cellphone number: 09297745672 (SMART). Or, if you wish to e-mail me, here's my e-mail address: clarencecruz16@yahoo.com. Salamat po. I want to add some information about my background. Currently, I'm studying in Silliman University, Dumaguete City, and I'm taking up Bachelor of Arts Major in Speech and Theatre Arts. Today is our sem break. Like I said before, I want and need to fulfill my showbiz ambitions so that I'll be able to help my family financially, especially my mother, who is the only one who supports my family. I also want to be an inspiration to everyone, especially to persons with autism. I want to remind everyone that even persons with autism have rights and capabilities to fulfill their ambitions, even when it is showbiz related. I also want to work with my celebrity crush, Julia Montes. I started having a crush on her ever since I first saw her in "Mara Clara". She’s a very good actress, really. She is also a beautiful person, inside and out, I feel and believe it. Aside from those, we share a number of things in common: we're both John Lloyd Cruz and Bea Alonzo fans, our favorite color is red and we both love spaghetti. I'm sure we'll get along well and be good friends. By the way, I also express my desire to star in "Growing Up", which stars Julia and a number of teen stars and their fellow veteran stars. It will be a very great opportunity for me to work with Julia, and her co-stars and crew, and to eventually fulfill my ambitions. I always wanted a role on the show, either a major, minor or cameo role. Aside from "Growing Up", I also want to star in "Budoy", since I myself am an autistic person. I also want to be a guest in “Kris TV”, so that I can tell everyone my story and my ambitions. Aside from Julia, I also wanted to be friends with Ma’am Kris Aquino because her son Joshua is a special person, like me. I’m sure we’ll get along well and be friends. I promise to be a good Kapamilya star to everyone, especially to those with autism. I also promise to be a good friend to Julia, and her fellow Kapamilya stars and staff. Promise, I won't disappoint you all. If I finally have a showbiz career and be a part of ABS-CBN, I will do my utmost. I'd be very happy and grateful if ASP and ABS-CBN can help me fulfill my ambitions. I would like to thank you all for appreciating what I did, and for helping and encouraging me fulfill my ambitions. Thank you so much to all of you, especially to ASP and ABS-CBN. Take care everyone.